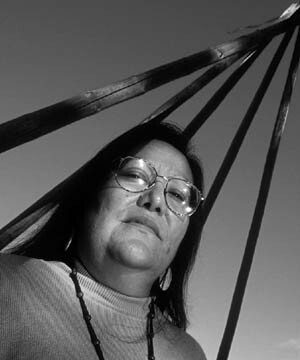 Judy Gobert, chairwoman of the Indigenous Peoples Council on Biocolonialism, says that some biotech companies have become so desperate for Native American genetic material that theyve had representatives approach Indian schoolchildren in California and offer them $100 for a single blood sample. According to Native American beliefs, all life is sacred and should not be tampered with. Thats why native activists from around the nation are taking aim at bioengineering projects that clone animals, create new plant species, and splinter human genes into their tiniest fragments. Whats especially galling to high-tech opponents is the fact that most of the research is being done for profit, often at the expense of indigenous peoples and their traditional ways. Anything thats living can now be owned, maintains Judy Gobert, chairwoman of the Nevada-based Indigenous Peoples Council on Biocolonialism. Gobert, who also serves as dean of Salish Kootenai Colleges math and sciences program in Pablo, and as chairwoman of the American Indian Science and Engineering Society, says biotech companies know no boundaries when it comes to studying native peoples. Researchers have long been intrigued about the migration of native peoples across the former land bridge between the Aleutian Islands and Russia. Studies of northern-tier natives have been going on for decades, but Gobert says the new twist is that DNA samples are now being used to determine who may have come from whom and where. DNA is short for deoxyribose nucleic acid, which acts as a codebook for genetic origin. While some of the research has undeniable value, Gobert says tissue, blood, hair and other samples are often obtained without the informed consent of donors, who may have unknowingly contributed the samples through routine medical exams or through other sources who didnt reveal the material might be sold to third parties. One of the most recent battles over DNA research revolves around the so-called Kennewick Man, a 9,300-year-old skeleton found in 1996 along the Columbia River in Washington state. Scientists, including two from the Smithsonian Institution, want to determine the skeletons genetic origin. Umatilla Indians contend the bones should be reburied immediately, without further study. Researchers sued, arguing that theres no proof the skeletal remains are related to the tribe. The issue remains bound up in court. Researchers also have special interest in native peoples because some groups have unusual immunities or propensities for various diseases, and scientists want to figure out why. But Gobert says the biotech field has become so commodity-driven that Indian genetic samples are now available over the Internet for as little as $209. Patents on plant, animal, and genetic material can be obtained by nearly anyone, and few ethical guidelines are in place to ensure that basic human rights are not violated, she says. Also stirring up biopiracy opponents is the creation of new plants and the alteration of plants and animals through genetic engineering. Transgenics, which breaks down natural borders by crossing species that would not normally interbreed, has resulted in scientists injecting fish genes into tomatoes, petunia flower genes into soybeans, bacteria genes into corn, cow growth hormones into chickens, and human genes into tobacco, kiwi fruit, mice and sheep, according to one of the groups publications. While genetic engineering has produced new strains of food crops that are at least temporarily resistant to various pests and diseases, activists also worry about potential unintended consequences, such as unleashing new biological materials that could wipe out native plant and animal species. Another aspect of the biotech battle, Gobert and Shelton say, is the effort by some pharmaceutical companies to surreptitiously obtain information about plants and herbs used traditionally by native peoples for food and medicines. Once the companies get the details through bio-prospecting, some try to patent their uses. Then they get the copyright and they own our knowledge, Shelton says. Activists say its important for tribal governments to band together and fight attempts to alter the natural world. They say tribes also need to prod the federal government into exercising its trust responsibility to protect Indians from this latest round of theft.